Risotto, I’m told, is like a great romance – It seems daunting and impossible until you’ve got it and then it gets better and easier as time goes by… Now I can’t claim to have much authority on the great romance side of things, but risotto’s I know. And I know them well. 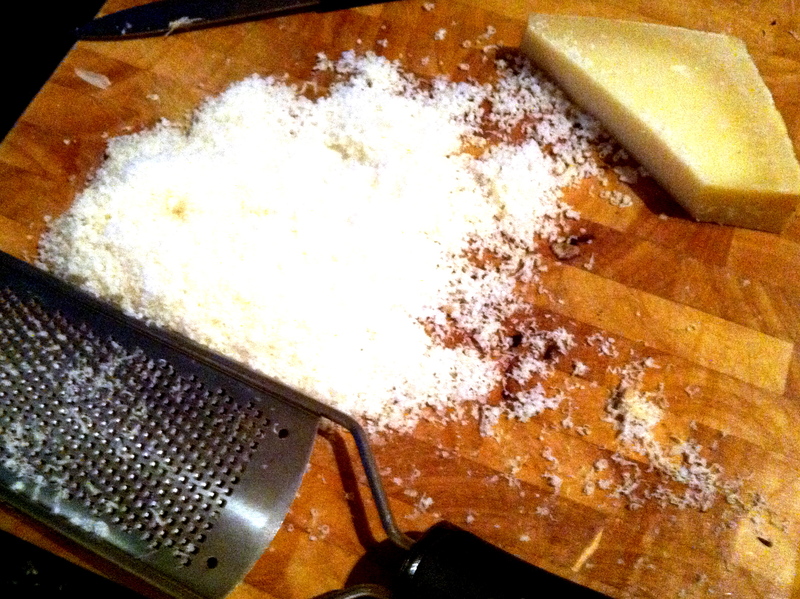 Therefore I would like to dispell these rumours that risotto is difficult or hard to make. 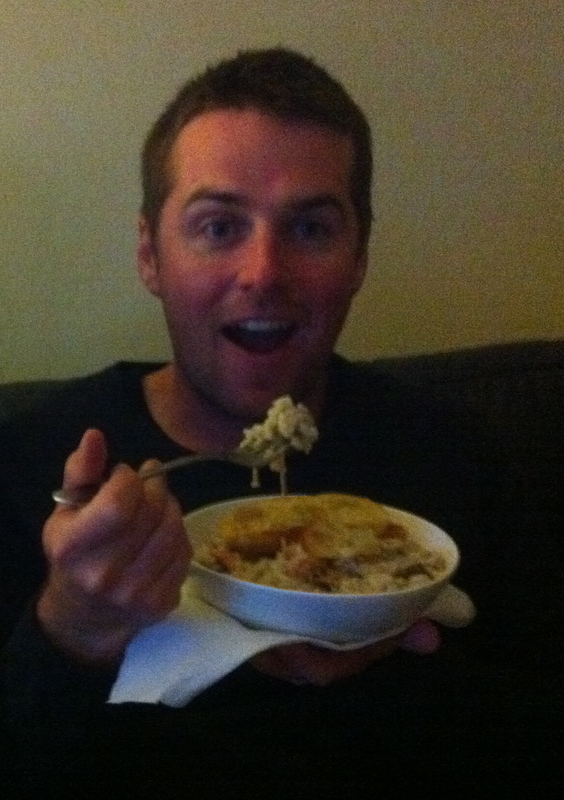 It’s just slow cooked rice! Sure there are no real shortcuts and then there is all that stirring but once you’ve made this rewarding oozing dish at home I’m sure you will add it to your recipe repertoire, if it’s not there already. It’s so easy onion + rice + stock + stirring+ butter + cheese = dinner! Use Italian Arborio rice if possible, the grains are short and stubby and absorb liquid without becoming gluey. Use a big heavy based pot if you can. Be patient with the onions – this is the soffritto (Italian for flavour base) so take the time to cook your onions slowly and gently at the start for 5-10 minutes will give your dish a wonderful sweetness. Hot Stock – if you have fresh, great, but most of the time I use whatever is in the cupboard. The main thing is to have it ready and hot with a ladle, on the hob beside you risotto pot, so you can easily add it and it stays hot. 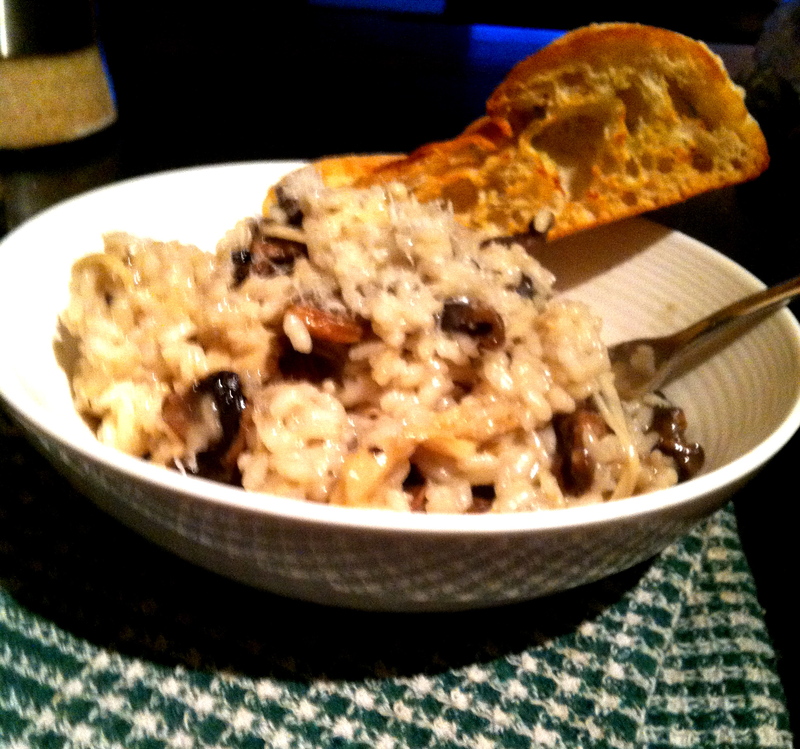 Resting– leave your risotto, off the heat, lid on, to rest for 5 minutes before serving. Topping – I used a mixture of mushrooms, I used 1 pack oysters, 1 pack enoki and a handful of sliced chesnuts. but you can use any vegetables you like here just bear in mind some will need to be pre-cooked. 1 onion, peeled & finely diced. 1 garlic clove, peeled & finely diced. Remember you have to stir this constantly from when you start so get everything you need ready to go before you begin or make sure you have helpers on hand. 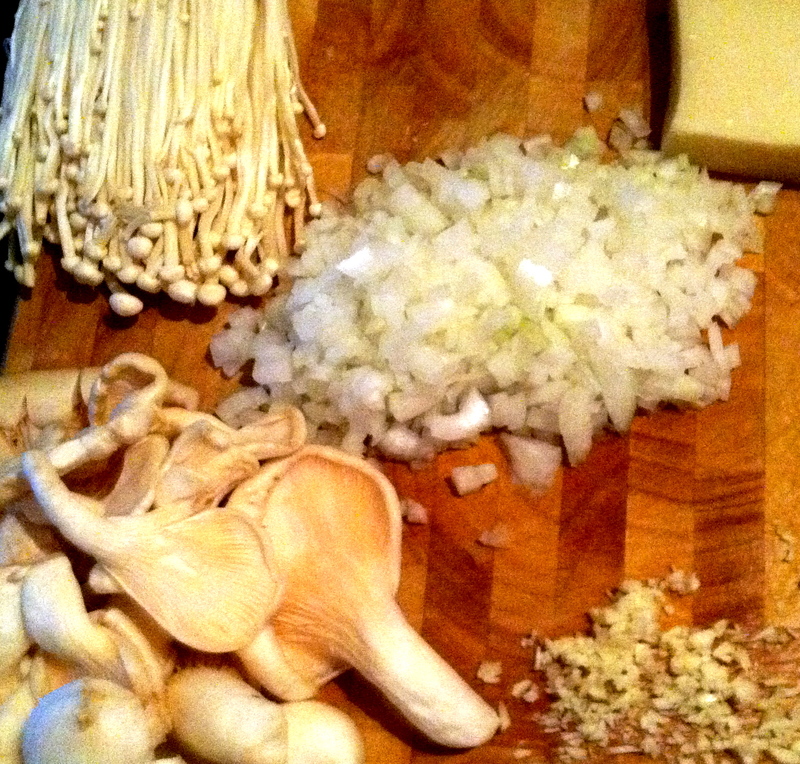 First step prepare everything – chop onion, garlic, mushrooms, make your stock & get it on the heat and hot. I always cook my topping first, in this case the mushrooms are just pan fried and then tip them into a bowl to add to the risotto towards the end. Then for the risotto, firstly cook your onions and garlic gently for 5-10 minutes until they are soft and fragrant, this is your soffritto. Next in goes your rice, stir the rice until it is all coated and glistening. Add you alcohol and stir until the alcohol cooks off (when the boozy waft is gone, just a minute of so) and then you start to add your stock. Add a ladleful of the stock into the rice and keep stirring until the stock is absorbed. Then add another ladleful and stir again. Keep going until the rice is cooked but still has bite, just keep on tasting until you think it’s done. You may not need all your stock – or you may end up needing more, you can always add some hot water instead if necessary. Turn off the heat, season, add your butter, add your cheese. Stir. Add your topping and then REST.